President Donald Trump announced in a tweet that Mattis was retiring, but that's not what Mattis said. 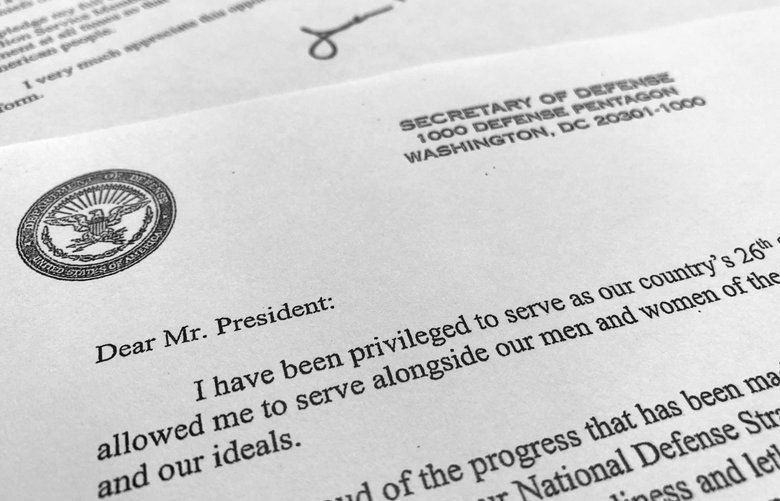 He wrote the president that he was leaving because "you have a right to have a Secretary of Defense whose views are better aligned with yours." Mattis went to the White House with his resignation letter in hand to meet with the president and spoke to Trump for about 45 minutes, according to a senior U.S. official familiar with the incident but speaking on conditions of anonymity to discuss a private meeting. There was no confrontation between the two men, the official said, and there was no one issue that caused the resignation. However, the official said, Syria likely was the last straw for Mattis. Mattis did not mention the dispute over Syria in his letter or proposed deep cuts to U.S. forces in Afghanistan, another significant policy dispute. He noted his “core belief” that American strength is “inextricably linked” with the nation’s alliances with other countries, a position seemingly at odds with the “America First” policy of the president. The announcement came a day after Trump surprised U.S. allies and members of Congress by announcing the withdrawal of all U.S. troops from Syria, and as he continues to consider cutting in half the American deployment in Afghanistan by this summer. The news coincided with domestic turmoil as well, Trump’s fight with Congress over a border wall and a looming partial government shutdown. Mattis’ departure has long been rumored, but officials close to him have insisted that the battle-hardened retired Marine would hang on, determined to bring military calm and judgment to the administration’s often chaotic national security decisions and to soften some of Trump’s sharper tones with allies. Mattis went to the White House Thursday afternoon to resign after failing to persuade the president in a tense Oval Office meeting to change his decision on withdrawing troops from Syria, according to two people with knowledge of the conversation but not authorized to discuss it publicly. Another U.S. official said that Mattis’ decision was his own, and not a “forced resignation.” The official spoke on condition of anonymity to discuss internal deliberations. More recently, Trump bypassed Mattis’ choice for the next chairman of the Joint Chiefs of Staff. Gen. David Goldfein, the Air Force chief, was Mattis’ top choice, but Trump chose Gen. Mark Milley, the chief of the Army.